The final day. Again we split up into two teams: clean-up and cooking. Outside its windy, raining and so cold. The cooking team sets up our kitchen tent in front of the supermarket near the residential area where many people stay in the upstairs level of houses. We have been told that no other group has cooked for these people yet. 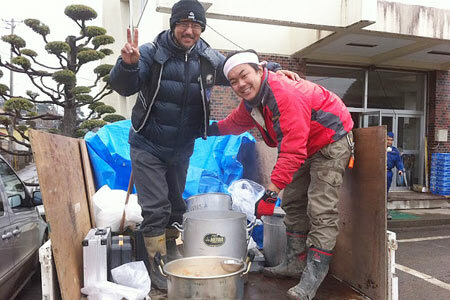 So we cook as much as we can—soup with lots of vegetables for 1,500 people. While the rest of the team cooks, five of us go door to door and visit each and every house to let people know that we are cooking food for them. I see an older couple, backs bent, as they work to clean up their house. It is painful to watch; it is really too much for them. But they are quietly and patiently doing the work at their own pace. We walk through an area where the road is completely blocked with overturned cars. The houses here are badly damaged. We keep shouting, “Hello! Anybody home?” and tell them that we have hot soup, and they should please bring their pots. The news is received happily. Usually all the food and necessities are given to the temporary shelters, since their numbers are clear. However the people who have stayed in their homes feel like they have been forgotten. I cannot blame anyone, as going house to house seems an almost insurmountable task, and the volunteer groups are barely able to attend to the people in the shelters. More help is needed. As the people come to receive the soup we prepared, I explain that these vegetables have been chopped by the women from Niigata, who themselves stayed in temporary shelters four years ago after the earthquake there, and that they have come to help the people here after having received so much assistance in their time of need, and being helped to overcome their own tragedy. As we fill their pots with soup, I remind them that so many people are with them, and that people all around the world are praying for Japan. They smile with watery eyes. We also deliver soup to a school which has been converted into a shelter for another 80 or so refugees. Inside, I see a man giving haircuts to the other refugees. He tells me, “I am staying here with my wife. She is a teacher here. I am a hair stylist so I am trying to help with what I know…” With the help of the SDF the people here have just had their first bath yesterday after 14 days with no water. 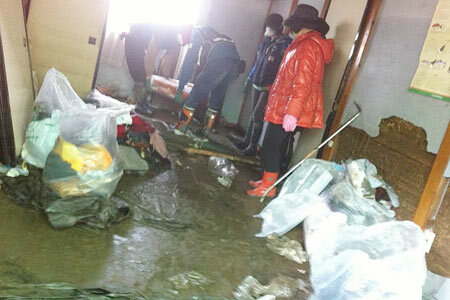 In the afternoon, I join the clean-up team. There is a rule in place that even if people abandon their house, it is their responsibility to remove everything from the house. 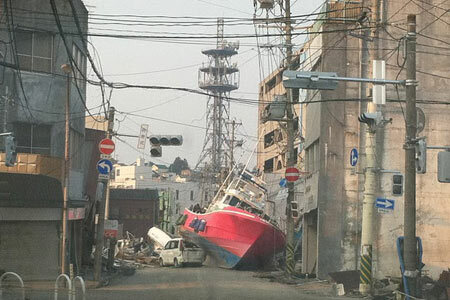 We come across a family with relatives in Sendai City; they are moving the day after tomorrow. 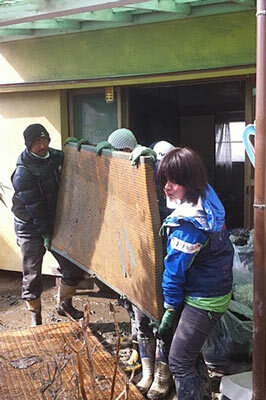 We stop and help them with the heavy work of removing everything from their house. 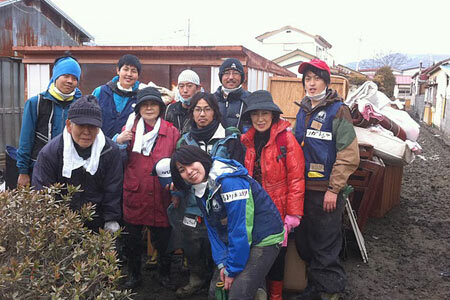 Even though the area is filled with rubble and devastation, the people evacuating their houses are taking pains to do so in a neat and orderly fashion, with the garbage on the street very well arranged in order, everything in plastic bags and neatly placed in line—very Japanese discipline. I am reminded of a ritual from my own family—every New Year’s Eve we used to clean the whole house. But before throwing anything away, even old furniture, a refrigerator or a desk, we would clean it meticulously first. Everything we remove from the house is still soaking wet. The desk drawers are full of stinking water. The floor mat is heavy with water. One member of our group participated in an ETW housing project in India almost 13 years ago. As we we work, he suddenly starts to sing some of Amma’s bhajans (Amba Bhavani, Amma Amma Taye). He looks at me and says, “I still remember these bhajans even after 13 years! !” After that we all start to sing together as we work. Many of our group members have been to India and met Amma, and we often talk about Amma during quieter moments. It is obvious that so many houses need help. We make a plan to return April 4th with a larger group of about 50 student volunteers, to help clean up more houses and cook more food as well. The refugees’ persistently positive attitude here reminds me of the attitude of the people in Gujarat, which they shared with Amma when she visited them after the 2001 earthquake: “God gave us everything. Now he has taken it back. It never belonged to us in the first place, so we are not sad that it is gone.” Moved by their plight, Amma helped to rebuild three entire villages for those people. The local university has made a new rule that the students get credit if they participate in relief work. I believe it is good for students to see these situations and to interact with people here; it is good for people in the temporary shelter as well. Here we can learn so many things which one can never learn in textbooks. This is a chance to learn the most precious things which we might otherwise forget: compassion, patience, sharing, simplicity, thankfulness for everything we have and which we take it for granted ….life, death, coexistence. I wish everyone could have this precious experience to serve people who are so in need of help. I am sure this will change one’s perspective forever—true transformation is bound to happen. Wonderful, Viveka, please go on sharing your experiences!!! It is so touching. It makes me wanna give even more money to support the volunteers in their help for the victims. At least I am happy to be able to help financially, even though it is not possible for me to come and work together with you. Thanks Viveka for the very touching report. Very inspiring also, the way that the Japanese people in general have reacted to the tragedy, as it has been shared over the internet. Beautiful qualities. Next Post Q175: Invisible Soul?